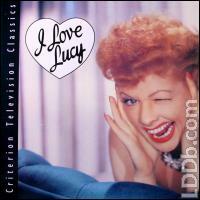 Disc includes original Philip Morris cigarette adds with Lucy & Desi. Complete uncut versions of two I Love Lucy classics; "The Candy Factory" and "Vitameatavegamin"
Audio Commentary by Madelyn Pugh and Bob Carroll, Jr. Audio excerpts from "My Favorite Husband"
Extensive liner notes on jacket from Bart Andrews and Madelyn Pugh Davis and Bob Carroll, Jr.